2. Students should lay their chart paper on the desk so it is visible to the group. 3. Tape a note card to each tube. 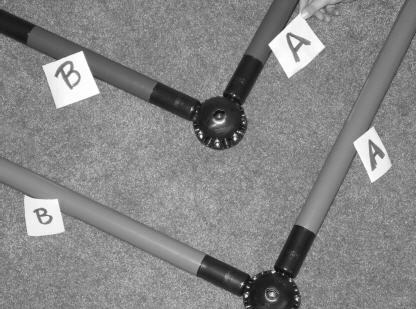 Label one tube in each triangle “A” and abel the other tube “B.” These will serve as the right angles in the groups’ triangles. 1. After dividing the students into teams, a mini-lesson should be presented to the class on the Pythagorean theorem. Be sure to review techniques for solving the equation. Challenge: Each group will construct right triangles using Toobeez and learn to predict side lengths of triangles using the Pythagorean theorem. 3. 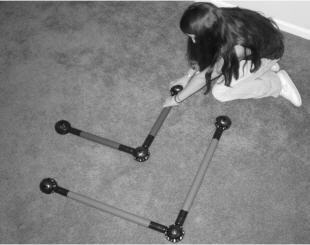 Using the meter stick, groups should measure and record the length of the two sides of each angle built during the setup phase of the activity. 4. Groups should use the Pythagorean theorem to solve the length of the hypotenuse using the side lengths measured in Step 3. 5. As a group, students should use a meter stick and their answer from Step 4 to deduce which tube length is required to build a right triangle from the angle models. A consensus should be reached in the student groups. 6. Students should try to then build a right triangle using a tube of the agreed upon length. 7. After the activity, circle up the group and ask them the following question: “How can you use the Pythagorean theorem to identify which tube length was required to build a right triangle? Why/how could the Pythagorean theorem be useful in everyday life? How did using the Pythagorean theorem enhance communication between students? 1. A more complex puzzle. 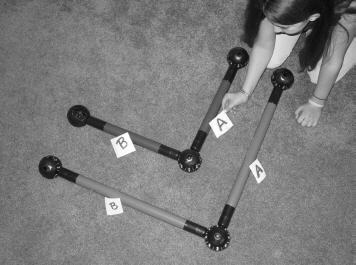 Students should build an initial right angle using two 36” Toobeez tubes. Have students solve for the hypotenuse and build a right triangle. Hint: The hypotenuse required consists of two 24” tubes with a sphere in the center. Have students draw right triangles, collect length and angular measurements, and note any observable relationships between the two sets of variables.